Talent: Jumping power, zone play. 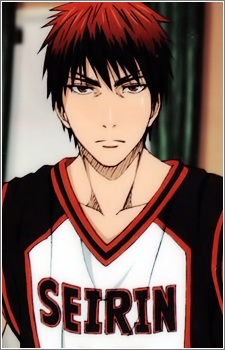 Kagami was in America until second year of middle school and has recently come back to Japan in his first year on senior high. He is determined to surpass "The Generation of Miracles" and become the number 1. Along with Kuroko, they're the only two freshmen allowed to play in matches. At the start of this manga, Kagami is shown to have a huge potential—good build, height, skill in basketball—but his strongest weapon is his inhuman jump. With those jumps (that gradually gets higher and higher every time he jumps), he managed to block his opponent's attacks. He's really bad at studying and always get low grades even in English (even though he's a returnee!). He's unexpectedly good at cooking, since he lives alone, and he also has an enormous appetite, which is shown when he orders tons of burgers. In the past, he was attacked by a dog, and that made him afraid of dogs until now (but later on he's able to deal with Tetsu No. 2, Seirin's pet dog). Even though it looks like they always disagree over things, he and Kuroko are actually on good terms, and they're called Seirin's Freshmen Duo. In the second fight with Touou, when he's so hopeless in facing Aomine, Kagami enters 'the Zone', which is to be called a perfect concentration during a match that everything around you is white, you can't see or sense anything except your own match. In the next round with Yousen, he enters the Zone again, even though the Zone is very hard to enter the second time. In the Finals against Rakuzan, Kagami enters the Zone for the third time, but only in the first seconds of the game. In episode 8 of the third season, Aomine wonders if the Generation of Miracles, meeting Kuroko, and being on the same team during the same era and ending up as rivals in the end was all a coincidence. He also mentions if meeting up in the tournament was coincidence too and if destiny was real. "The fact the Kagami showed up, the one who was the same as the GoM but didn't become a part of it and was the last to awaken with their same talent. A Miracle that isn't a Miracle and the true light that met the shadow of destiny." The world of anime in 2013 was a whirlwind of quality. Some of the most popular shows in recent history came out this season, giving anime a massive popularity boost overseas. We've collected the top 20 anime of 2013, based on their MAL scores. Are your favorites on the list?